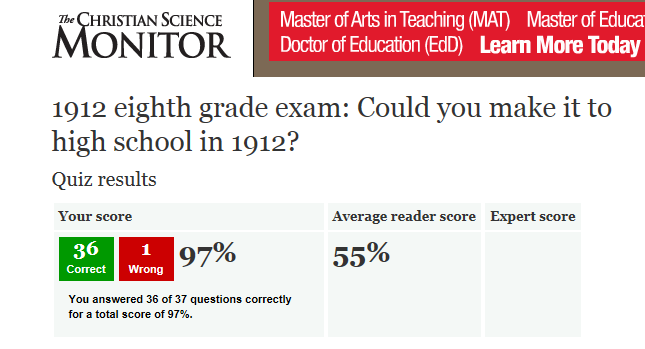 1912 8th Grade Exam- Fail Means No High School For You! Dave Davidson posted a link to this test on the SME LinkedIn Group and of course I had to take the test. This test determined whether or not you would be permitted to attend high school back in the day. Had I not helped my wife with the teaching duties when we home schooled, I’d have done much worse than I did. Strong on technicalities of English and Geography; the Math was smaller portion of the test than I expected, but would stymie many job seekers today. If you can pass the math questions on this, you are probably already a pretty good machinist or engineer. And if you miss the one about the last battle of the civil war, it’s probably because you guessed the one that wasn’t listed as a choice. This entry was posted on Thursday, September 19th, 2013 at 3:53 am and is filed under Break Room. You can follow any responses to this entry through the RSS 2.0 feed. You can leave a response, or trackback from your own site.